If you missed my last post, Thankful: Part One, you can view it here. At 3:30 p.m., two hours before I had to put my Thanksgiving turkey into the oven, the electricity went out. You may be wondering why. The simple answer is because this is Africa and things like this just happen sometimes. For the first 15 minutes, I sat quietly trying to ignore the situation telling myself that it would come back on any minute. When it didn't, I sent Mr. Deep a frantic SMS and then went outside to determine the answer to the big question...is the whole neighborhood out or just us? The hope of course, is that the whole neighborhood is out in which case you can assume that the problem is a known issue, being worked on and hopefully will be fixed soon. I quickly learned that the whole neighborhood was out. Then, I had to decide to what to do about Thanksgiving dinner. I consulted Mr. Deep. Mr. Deep, you will remember, was not going to be present for the Thanksgiving dinner because of his office holiday party being held the same night, but luckily I was able to chat with him while he was still at his office and before his festivities began. Mr. Deep suggested I cook the turkey on our charcoal Weber braai (grill.) He tried to walk me through the process via SMS, explaining that I needed to light the coals, then move the coals all to one side to cook the turkey over indirect heat. He also said I'd have to rotate the turkey every so often and monitor the temperature. He suggested I have a second batch of coals ready to go in case I need a heat boost. All of this sounded very daunting. While Mr. Deep is always confident in his opinions, he did write, "keep in mind I have never tried this but what options do we have?" I could only imagine our bird, black and charred on the outside and raw on the inside. I considered scrapping Thanksgiving entirely, ordering pizza or taking my guests out for dinner but I really didn't want to disappoint everyone. Thanksgiving dinner is something you look forward to and I knew my visiting American friends were excited about it. Pizza, while great any other day of the year, is not an acceptable substitute. In addition to my American friends, I had also invited Gift. I had been sharing the details of the amazing traditional Thanksgiving meal with him to build up his excitement. He told me he had never eaten turkey before. So for the sake of my guests, I had to give Mr. Deep's idea a try. The turkey was not my only challenge. While we do have a gas stove (but not oven) I wasn't sure how I was going to heat up the potatoes, stuffing and green bean casserole on the stove while also making the gravy. But these issues would have to be addressed later, I had to make an attempt to get the turkey cooked. While I was appreciative of Mr. Deep's patient guidance and suggestions, I was also becoming extremely annoyed at him for having to go to his party. I was actually wishing we had a kid so that I could have lied and told Mr. Deep. "You have to come home right away, I think little Paulie has a broken arm." Then when he arrived I would have said, "oh he seems fine now, but while you're here can you braai this turkey?" I know Mr. Deep could have pulled it off. But Mr. Deep was leaving the office for his party and I was left with a bag of charcoal, a raw turkey and cold side dishes. 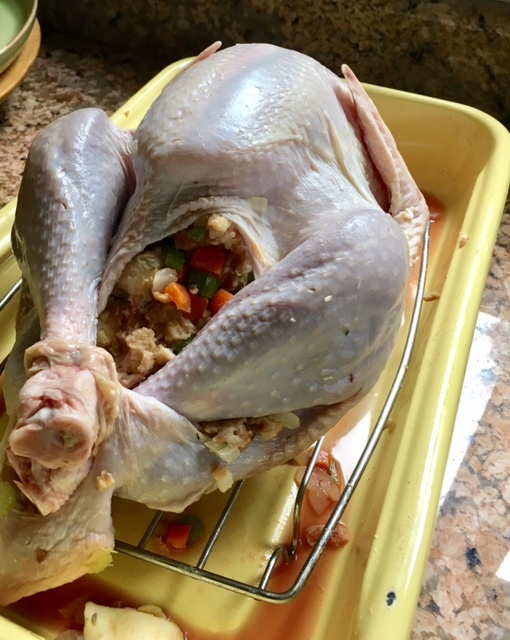 In addition to being scared that this braai the turkey idea would fail miserably possibly resulting in a ruined meal or worse, salmonella, I also had a logistical challenge. I was supposed to pick my friends up at Lanseria Airport at 5:50 (they had flown to Cape Town for a few days) and then I had to pick Gift up at his house. I wasn't going to be home while the turkey was cooking to rotate it, monitor the temperature and light a second batch of coals. Mr. Deep suggested I get an Uber for Gift which would get me back home quickly after my airport pick up. So I frantically got in touch with Jonathan, our favorite Uber driver, and asked him if he could pick up Gift. Because I was in crisis, rather than just calmly requesting his assistance I told Jonathan about the whole drama. I told him that we'd pay him by EFT and I let him know generally where Gift lived. I then had to let Gift know that Jonathan would be fetching him. Once I got all of that straightened out, it was 4:30 and I had to proceed with this absurd plan and light the coals. I only had a 3/4 of a bag of charcoal, not enough for a second set of coals if needed. I also realized in a panic that since the refrigerator wasn't working the beer and wine would not be cold. It's one thing to tell your guests they aren't going to have turkey, but it's another thing to make them drink warm beer, so I decided I also needed to run out and get some ice. I quickly changed my clothes as by now, I was really running out of time. It was 5:00 and I had to leave by 5:30 at the latest to pick up my friends. I drove to the Spar grabbed three bags of ice and a bag of charcoal. As always happens when you are in a major rush, there was a delay as the person in front of me at the check out line had apparently had never used a credit card before. Finally I made it back home. I rushed in, slammed the bags ice onto the floor to break up the chunks and emptied all three bags into the sink. I threw some beer into the ice and ran outside. I moved the hot coals to one side, added a few pieces of firewood (at this point why the hell not) and put the grate on. I placed the stuffed turkey, in the pan and covered with foil, onto the grill. I put the lid on. The braai was really hot (400 F) and smoke was everywhere from the wood. Of course I also left the big sliding glass doors open so the house was now filled with smoke. I was not feeling confident in this plan but I had to hope for the best and leave the house to collect my friends. I grabbed my purse and shut off the kitchen lights. Wait? The kitchen lights were on. The power was back! I have no idea if it came back on while I was at the store and I was so busy dealing with the ice and the charcoal that I just didn't notice? Or maybe it had only come back on that very second. I ran outside and grabbed the turkey off the braai. I came back inside, threw the turkey in the oven, turned the oven on and ran out the door. Three hours later we enjoying our delicious turkey with all the trimmings. My pan shall forever serve as a reminder of what I endured. Yes, it was quite stressful but as you always say there is a never a lack of blog material. South Africa just hands it to you on a platter sometimes in the form of a raw turkey. Hope you had a wonderful Thanksgiving! Happy holidays. Thank you so much for reading my blog. I'm glad you enjoyed the post.